Bournemouth (United Kingdom) (AFP) – Fresh from one of the most remarkable comebacks in their history, Liverpool return to domestic duty with a trip to the seaside to face Bournemouth for only the second time in a Premier League fixture. Thursday’s 4-3 win over Borussia Dortmund will go down in Liverpool folklore alongside their 2005 Champions League final win in Istanbul as one of the club’s great European triumphs. 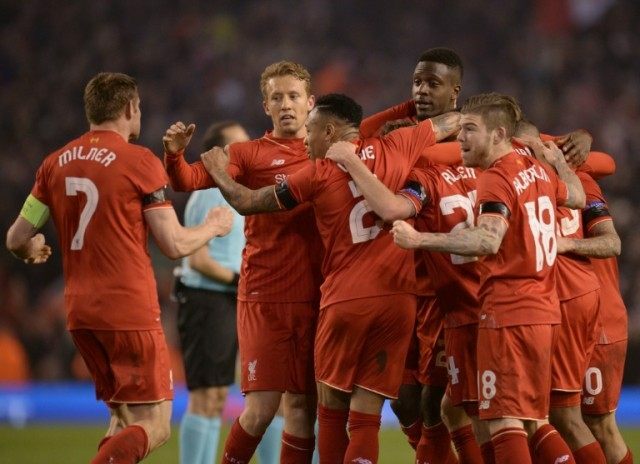 They came from 3-0 down to beat AC Milan and become European champions for the fifth time in an epic recovery that was inevitably recalled on Thursday when Liverpool, who trailed 2-0 and 3-1 against Dortmund, scored four second-half goals, including a stoppage-time winner, to reach the semi-finals of the Europa League. The contrast between a packed Anfield with close to 43,000 supporters hitting fever-pitch and Bournemouth’s 11,500 capacity stadium on the genteel south-coast on Sunday could hardly be greater. But eighth-placed Liverpool still need the points to try and guarantee European football via the Premier League next season and can’t afford to relax in the aftermath of their stunning European exploits. Reds manager Jurgen Klopp will therefore have to raise his players again and acting captain James Milner has no doubt the former Dortmund manager will get the required response after revitalising Liverpool since his appointment last October. “He is putting his style on the team,” Milner said. “It is taking time to get that and get that ingrained in you. Maybe it has not been natural to us. “But hopefully now it is second nature to how we want to play and I think the belief he has given the boys is massive. “The result at the weekend (against Stoke) was important and we have a lot of young players who have come in and are pushing for shirts as well. “Everyone is united and you could see that. We wouldn’t be able to pull that result on Thursday night off if we weren’t. Liverpool, who have been drawn against Spanish side Villarreal in the Europa League semis, have lost just one of their last 13 games and are looking to complete a league double over Bournemouth, who they also knocked out of the League Cup, in the Cherries’ first season in the top flight. Klopp is set to make a number of changes with a Merseyside derby against Everton to come next Wednesday and is definitely without midfielder Emre Can, who is suspended and injured after being stretchered off against Borussia with an ankle injury. Liverpool may have enjoyed a memorable moment against Dortmund, but it has also been a remarkable season for Bournemouth. Eddie Howe’s side are hunting a top half position but are without striker Benik Afobe due to a hamstring problem. Even though safety is all but assured with 41 points to their name, Howe is refusing to accept that and will not allow his side’s standards to drop. “There is no time to look back in this league,” he said with the Cherries occupying 11th place ahead of the weekend games. “Every game is of huge importance, regardless of what your individual targets were at the start of the season. “I said after the Aston Villa game that I will not say we are safe — we’ve still got five games to play. In addition to Afobe, Adam Smith and Harry Arter are again likely to be sidelined, but Howe is hopeful that Junior Stanislas will return after a hamstring problem.